Bern is the capital of Switzerland. It is an ancient city with arcades and bridges that span the gorge of the river Aare. There are large residential and industrial areas surrounding the city centre which are served by both trams and trolleybuses. Electric trams started in 1901 and run on metre gauge track. There is also a light rail line that runs from Casinoplatz to Worb operated by RBS but shares the lines of the Bernmobil, the Bern tramway who have operated the system and the buses and trolleybuses since 2000. The current tram fleet consists of 12 Vevey/ABB/Duewag articulated, 7 Be 4/6 Siemens Combino Advanced, 8 Be6/8 Siemens Combino Advanced and 21 Siemens Combino Classic cars. Our filming starts at Hirschen Graben in the city centre and then we make our way onto Kornhausplatz and Kornhausbrücke for some superb action shots of the trams passing over the bridge. Moving on to Casinoplatz we encounter the Tram 2000 cars of RBS in their smart blue and red livery. Our cameras then take a ride on board tram 733 back to Kornhausplatz on route 7/9. More action is captured at Bubenbergplatz and around the city centre before we board tram 734 on route 3 to Weissebühl. We then return to the city on tram 740 also along route 3. Our cameras then sample a ride on 660 one of the new Siemens Combino Classics, on the service to Wankdorf Bahnhof along route 8/9. These smart new trams give an excellent ride, and the route gives you a good view of the outer reaches of the city. We return to the city centre by trolleybus, on board fleet number 18 a Hess Swisstrolley BGT-N2 where we complete our filming at the Bahnhofplatz. Our filming now moves to the south of Switzerland and the city of Geneva. This is a French speaking city situated at the west end of Lac Léman. 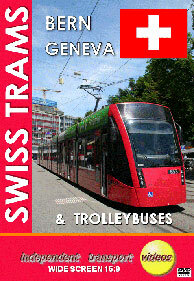 It is a big commercial and industrial city with a large fleet of trams, trolleybuses and buses. The current tram fleet consists of older low floor Duewag cars dating from 1984, with 39 newer 100% low floor Bombardier Flexity Outlook Cityrunner trams and 32 Rail Tango Stadlertrams which are still entering service. Filming takes place in the busy city streets from Rue de la Confédération to Rue de Rive, as well as Cours de Rive, Pont de L’lle and Place de Cornavin. The current trolleybus fleet consists of 80 vehicles, ranging from the oldest Saurer/Hess GT560 articulated to the newest Hess BGGT-N2C bi-articulated vehicles which you will see on this programme. There is plenty of action for you to enjoy, so sit back and take you seats for this Swiss tour of two cities.